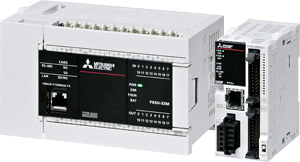 Mitsubishi's MELSEC iQ-F: The Next Level of Industry - Allied Automation, Inc. The Mitsubishi MELSEC-F series undergone many advancements, making way for the next generation MELSEC iQ-F Series, with enhanced high speed bus, expanded built-in functions, advanced SSCNET III/H support, and improved engineering environment with parameter settings in GXW3 engineering software. From stand alone use to networked system application, MELSEC iQ-F brings your business to the next level of industry. Awarded the iF Design Award in 2016!The German design award iF Design Award has a tradition of over 60 years and recognized all over the world. Next generation PLC MELSEC iQ-F series, developed from the user perspective to provide improved visual verification and prevent operation mistakes, was awarded the iF Design Award in 2016!